I've been busy, busy, busy this week and also full of insomnia. One of my goals, though is to try and review a good number of DMG titles. I'm also going to try and give props to the teams who do the work of translating/localizing these titles, so you'll see that up there in the attributes from now on. 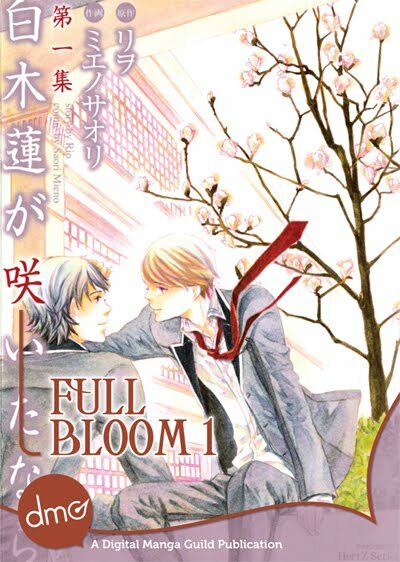 Full Bloom, Vol. 1 is a high school love story with light (so far) themes of gender fluidity/confusion. From what I can tell there is a boy/girl identical twin pair that like to swap clothes. Both of them go by the name Nagi because their parents couldn't tell them apart as babies, which I have a hard time believing if one is really a boy and one is really a girl. Anyway, this guy Shima Masaki, fell in love with the "girl" twin like three years before and confessed his love, but "she" ran away -- I guess to America, and Masaki has been pining after her ever since. One day, the twins show up at the school, and Masaki's heart goes all aflutter driving him into straight up stalker mode. His friend, Akira, who I think the comic is trying to portray as a bit of a player, is often around making observations or something and his other friend, Yuki, aka Prince, a manly woman who all the girls swoon for, is also around making observations. To be honest, I found this manga kind of hard to follow. The twin swapping was difficult to keep tabs on. I think because the twins have the same name and you never know if the boy is the girl or the girl is the boy because they change out their hair and their clothes outside of the panels. There was a lot of talk about which bus which character was riding, and we find out at the very end that Shima Masaki is like a super amazing karate champion. It would be nice for character building to know that earlier, I think. I don't know about this manga. I sort of followed the story, but toward the end, I just couldn't figure out anything to do with the twins, like if it was the boy who liked Masaki or the girl or if they were both actually girls or boys. I know one of the pair was clearly annoyed about something, but I couldn't quite put it together. This was a cute, well-drawn manga, with a plot that I think is interesting. Maybe Vol II will bring it all into clearer perspective? I hope so! Did anyone else read this? Was anyone else completely bewildered? I found it hard to follow the first time I read the scans, which is why I bought the localized version to see if I could follow it better. I understand it much better now, mainly because I figure out how to tell the twins apart. The boy parts his hair to the left, and the girl to the right no matter what disguise they are wearing. I'm still somewhat confuse on a few things. @Lucy, Thanks!!! I will reread it again with that tip in mind. I was just so confused by the end. I think maybe the second volume will help clear things up.